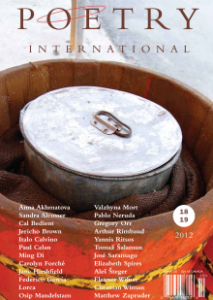 It was my contributor's copy of Poetry International 18/19, all 736 pages of it, a treasure chest of poems and reviews. I am particularly enjoying the profile on Jane Hirshfield, whom I will be hosting for a Transatlantic Poetry on Air reading in August. The hefty double-issue also contains a review of Nikola Madzirov's latest collection, exciting translations of Pablo Neruda, and many other gems. It will easily sustain me for another year. You can order copies directly from San Diego State University Press. Categories: Books, Poetry, and Publications. Tags: Poetry International. Poets: Fred Moramarco, Jane Hirshfield, and Jonathan Harris.